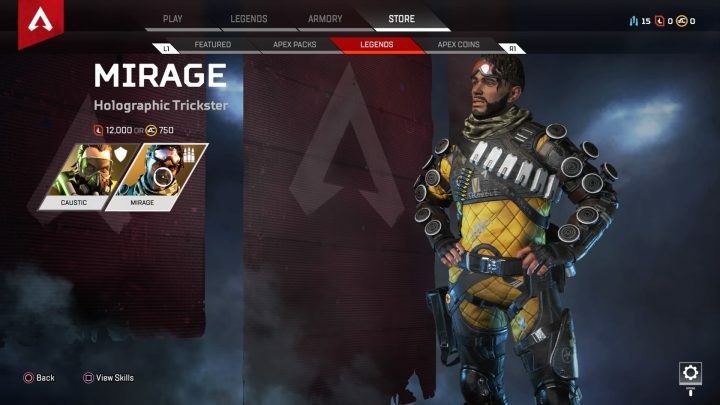 Apex Legends might be totally free-to-play, but there are two unlocks every player is going to want to get — Caustic and Mirage. These two ‘Legends’ are premium heroes you can purchase with premium currency, or unlock in-game with a lot of effort. Each character costs 12,000 Legend Tokens, which you’ll get as you level-up. Mirage is all about using his holographic tech to trick enemies. His ultimate unleashes an array of holo-clones, and turns the primary Mirage invisible. Caustic is a little less sneaky — choosing to deploy toxic gas traps, and with the ability to drop gas over a large area. The gas slows and weakens anyone caught inside it, and Caustic can see through the gas automatically. They’re definitely interesting characters that give your team even more options. The problem is unlocking them, and it is possible to unlock them for free. The Founder’s Pack DLC doesn’t even include these characters, but there are ways to speed up the process. Let’s break it down — Caustic and Mirage are unlockable heroes in Apex Legends. Find their individual costs in the Store tab. Both of them cost $7.50 in real money, or 12,000 Legend Tokens, which can only be earned as you level up. Here’s the simple math — you’ll need to reach Level 43 to earn enough Legend Tokens to unlock both Caustic and Mirage. You’ll need to reach Level 23 to earn enough Legend Tokens to unlock ONE of them. Respawn Entertainment developers say it should take about 15 hours to unlock one character, then another 15 hours to unlock another. That’s 30 hours total of game time. But, there is a way to speed up the process. For being an EA Access subscriber, you’ll get 1,000 Apex premium currency instantly. Those points are available on PC & Xbox — I haven’t confirmed if the 1k tokens can be claimed on PS4 yet. 1k of premium currency is $10.00; enough to buy one of the heroes instantly.